It's a mess. It's sad that this is the state of what passes as arthouse cinema nowadays. I didn't like Guadagnino's much phrased I am Love. Had no desire to see his remake of Le Picine, Bigger Splash, or Call Me by Your Name. This overwrought, over-serious and over-long take on Dario Argento's chinzy classic of the same name gets almost everything wrong. 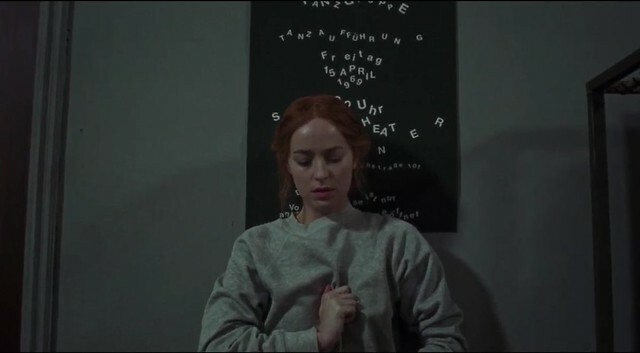 We get to know Susie Banyon (Dakota Johnson) fresh from Ohio farmland as she travels to always rainy, still divided Berlin, to audition for a Martha Grahamesque modern dance school. It is 1977, same year as the initial release year of the original. But this doesn't mean that they have to contextualize anything- and they do the hell out of it- Baader Meinhoff, RAF terrorists bombings and hijacking of the airplane and all that - both on the street and on TV and radio. But only on the surface level though. AND BECAUSE IT'S GERMANY, you have to have a concentration camp story. So Ohio and Mennonites background gets lost in the shuffle, even though Susie is supposed to be the chosen one. And because Guadagnino is buddy buddy with Tilda Swinton, she has to play two very different roles unnecessarily. Thai cinematographer/Weerasethakul's regular Sayombhu Mukdeeprom's sudden zoom-ins and busy camera movement are a total mismatch. Worse are distracting editing and terrible in camera effects. Worst is Thom Yorke's soundtrack which comes across as completely inappropriate for the material. Too bad because Johnson, Mia Goth and Swinton are all wonderful in their respective roles. There are some great visual moments -especially the eerie dream sequences and dance numbers. But the ending resembles later period Argento level of terribleness. I mean, it's From Dusk 'til Dawn bad. Wow, I mean, terrible. Guadagnino is not the knight of Shining Armour for the future of arthouse cinema. Get that in to your head.